Though it presents all sorts of ancillary problems, sometimes it's useful to deal in huge, sweeping generalizations. A study recently published in Nature found good use for these sorts of generalizations when it explored why Western food and Asian food taste so different (see Gizmodo for a summary of the study in less technical language). Of course "Western food" and "Asian food" are extremely loose terms that gloss over the incredibly rich diversity within these hemispheric regions, but for the purposes of this study it's a fair enough distinction--these regions' foods do tend to taste fundamentally different. Who knew that Jamaican Rum and Parmesan Cheese shared flavor compounds? This research apparently flies in the face of some of the recent ideas about chemistry-informed cooking that suggest using seemingly unpairable ingredients (e.g. chocolate and blue cheese) because they share flavor compounds. Obviously--as several millennia of Asian cuisine can attest--this approach is not the only way to develop interesting dishes. Anyway, I was glad to come across this study (thanks, Rachel!). It's a great reminder that there is no one way to make good food. The world is full of different ways to please our tongues and bellies, and for that I am grateful. As regular readers will know, this has been my experience, too. There's no doubt that unscrupulous vendors are out there deceiving people about the quality of ingredients, lying about what they are feeding customers, using gutter oil, or otherwise harming consumers, but these nefarious nogoodniks are the exception rather than the rule. For the most part, if you use common sense you will be fine. This documentary is an interesting look at a side of Chinese street food that we don't often see; it is definitely worth a watch. Great thanks to CET Academic Studies (and CET China Studies in particular) for creating this video and for their permission to share it here. Keep up the good work, CET! Visit their blog for more great shots of great food. 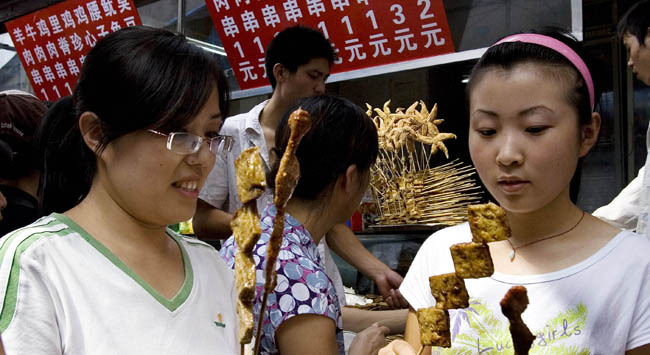 Changes are afoot in the Shanghai street food scene. Regulation is good if it helps keep people healthy, and it sounds like they are trying to make sure that access to these foods remains the same. Here's hoping this works out exactly like they are planning! Question 1: Why are you doing this? Answer 1: This one is a little tricky to answer. Here's the short version: I have a great affinity for China and Chinese culture, I love to eat street food, and I enjoy writing. This was a way to combine all of those into one amazing job. There's a bit more detail in this, my second blog post ever. Be warned, though, that you'll have to weed through some other expository details about my project to find the relevant points. Question 2: What does your wife think of this? Answer 2: My wife is, without question, the best wife in the world. Real quick, let's review all of the sacrifices she is making here: 1) I will be out of the country with occasional patches of inability to communicate for three solid months, 2) I get to go traipsing across all corners of China, and she has to stay home, and 3) She is going to be acting as the sole breadwinner for six months to a year here. Through all of this, she has remained incredibly gracious and supportive. The biggest issue (and the one people usually ask about) is that three months away from home thing. Leslie maintains, and I agree, that in the context of our whole marriage (which, assuming good health for all involved, will be going strong for at least fifty more years) three months apart is a drop in the bucket. It (along with the other two points) is a small price to pay, she notes, for me to be able to pursue a dream. Like I said, I have an awesome wife and I love her. Question 3: How are you paying for this? Answer 3: As of now, all funding for this endeavor is coming directly out of my pocket. I considered a couple other options (including a Kickstarter campaign) but ended up deciding this was the best option. My goal is to keep the costs of the trip under $4000. After I get back, there will also be costs associated with production of the book, but I'll cross that bridge when I come to it. Question 4: When are you going? Answer 4: I'm flying out of Washington, DC, on January 11 and coming back on April 11. Three months on the dot (disregarding the fact that I'll actually land in China on the 12th). Question 5: Where in China are you going? Answer 5: I'm planning to visit every province in China at least once for a total of 50 - 60 cities. A common follow-up question to this one is whether I have a specific route planned out. The answer to that is no--I have a general plan to start in Shanghai and move west through the south of the country and then go north from Lhasa and move back east through Northern China. This route is mainly designed for reasons of climate (the longer I put off going to Harbin, the warmer it will be...). Question 6: Do you have a publisher? Answer 6: No. I am currently planning to self-publish (hard copy and digital) and don't intend to actively seek out a publisher. That being said, if the option came up to work with a publishing company, it would receive my full consideration. Question 7: Aren't you worried about your stomach? Answer 7: Nope! 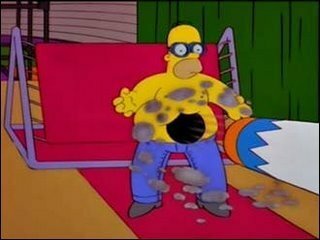 I have a mighty strong stomach that can handle most anything I throw at it with ease. That being said, I expect to get sick at least once while in China. As I wrote in this post earlier this year, that's just part of playing the game. Such is life. Question 8: Is there anything you won't eat? Answer 8: I'll eat anything so long as it isn't endangered or a primate. Anything else is fair game. Sometimes this question is a polite way of asking if I plan to eat dog. With apologies to any dog lovers in the audience, the answer is yes: if dog is available as a street food, I will eat it. Question 9: How can I help? Answer 9: Thanks for asking! In general, I am just happy to have your encouragement, whether spoken or unspoken. If you want to pitch in more tangibly, I encourage you to follow the blog (click that link on the right sidebar) and comment regularly. Once I have my Twitter and Facebook pages established, you can follow me there as well (in the meantime, you can find my personal page on Facebook). If you are really moved to help out, you are also welcome to make a donation with the PayPal button over there on the right. As I noted in answer 3 above, I am paying for this trip myself and am not counting on receiving any donations. Several people asked, though, so I set up the donation button. If you are so compelled, I thank you most graciously. I will make an effort to repay your kind generosity in some way, whether it be a postcard from China, a free copy of my book once it's done, or some sort of mystery prize. Question 10: I was told there would be pie. Is there pie? Answer 10: No, I'm sorry to say you were misinformed...there is no pie available on this website. For the curious: the characters there are 星 (xīng, which means "star") 巴 (bā) 克 (kè) 咖啡 (kāfēi, which means "coffee"). 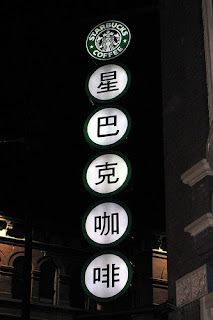 The "bā" and "kè" are meant to be phonetic, so you've got a rough simulation of "star-ba-kuh coffee." This is not to say that there aren't some pretty great Chinese restaurants in Chinatown...there are. They just get overshadowed by the slick corporate veneer of their neighbors. I still enjoy my occasional trip to Chinatown, but my expectations are much lower than they were before my first visit a couple of years ago. 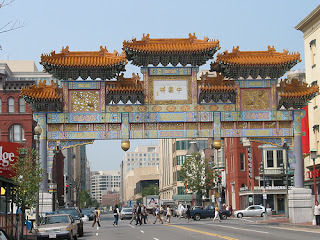 I'm thrilled at the prospect that there might be some street vending in Chinatown! To my mind, the street vendors are a large part of what makes a Chinese street come to life. Businesses in China are not all encased behind doors and walls and windows--they are right there on the street, a very visible part of the community. I can only hope that any street food vendors who come to Chinatown are serving up authentic Chinese street food. 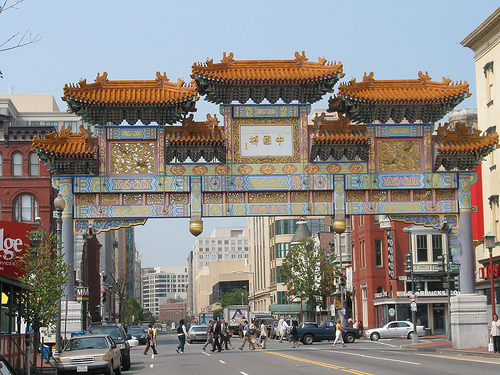 There are a lot of delicious street trucks roaming DC right now--it has really invigorated the street vending scene in the city--but their hip offerings wouldn't do much to foster authenticity in Chinatown. It seems to me that adding some true Chinese street food to Chinatown would be great for Chinatown and great for the city's street food scene (which is always seeking new flavors). It seems like a win-win all around. I've got my fingers crossed. Don't drop the ball on this one, DC government...we're counting on you. 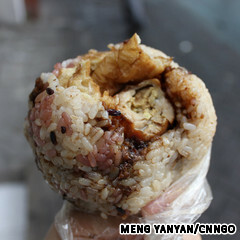 CNN International shares an interesting list of 5 Misconceptions About Hong Kong Food. 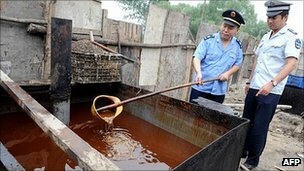 Lovers of street food will be particularly pleased to note misconception #4: the prevalence of thousand-year oil (also called gutter oil). For those uninitiated, I've written about the topic before, but the basic idea is that unscrupulous street food vendors reuse the same cooking oil day after day in an effort to save money. Though the practice does exist, it's likely less common than people think. The CNN article describes it as a "bogeyman," and I think that's a pretty apt description. The same way well-intentioned American parents often exaggerate the risks of, say, walking to school unsupervised (kidnapping exists, but it is extremely rare), parents in Hong Kong seem to be exaggerating the risks of street food. In my experience, most street food vendors are good folks just trying to make a living. Plus, as Mrs. Ho, the owner of Chuen Cheong Foods in Hong Kong, notes: "I have to face the smoke and grease from cooking everyday. I'm more afraid of getting sick from it than you are!" So there you have it. Don't let a bogeyman stand in your way of enjoying some great street food. A quick travel update: my plane ticket is purchased! I officially fly out on January 11 and return on April 11. Special thanks to Compass Travel for their help in getting me a great price. Glad to have the details of the trip materializing! Interesting interview with Andrew Zimmern on The AV Club today. 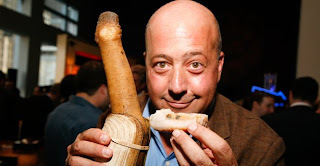 For the uninitiated, Andrew Zimmern is the creator and host of "Bizarre Foods" on the Travel Channel. One of the more common questions I get when people hear about my street food project is, "hey, do you watch Anthony Bourdain or Andrew Zimmern? Unfortunately, I have to say, "not often; I don't have cable...but I like what they do." Fresh from the local casserole farm. Who's to say that the geoduck is any more bizarre than the casserole? Both are ostensibly seafood. Both presumably taste good to some people (though both would have their share of naysayers). Both provide enough nutrition to go about your day. So where's the line between "comfort food" and "bizarre food"? Naturally the answer is found in human nature...we're creatures of habit. One man's favorite dinner is another man's stomach-churning nightmare, for no other reason than the world in which each was brought up. That's why I like to eat "bizarre" foods. If somebody out there eats something strange, then maybe if I give it a try I'll learn a bit about that person. It's a (often delicious) way to gain some insight into the fact that not everybody grew up in the same world that you did. Neither world is superior...just different. Our differences make the world dappled and interesting. This is what food diplomacy is all about. So from one gustatory diplomat to another, thank you, Andrew Zimmern, for your efforts to bridge the gaps between our worlds, one bite at a time. Spent my last few days getting the local flavor of the people and culture of Beijing by visiting the Chinese Street Market. I was starving, but there was no way I was messing with these. They deep fry them here. I am going to have to pass! That was accompanied by this picture of Mr. Stoudemire looking dubious by a street food vendor. He went on to note that it was the sea horses, silkworms, scorpions, lizards, snakes, and tarantulas that particularly turned him off. "I think I am ready to land in LA and hit up In & Out burger!," he quipped. Really? Look, folks, I can understand that there is a gross-out factor for Westerners when it comes to eating animals with more or less than four legs. I've also never tried an In & Out burger, although everything I've heard says they are a must-try delicacy in California. That all makes sense. But seriously...what a missed opportunity! There are lots of street foods that don't involve lizards. 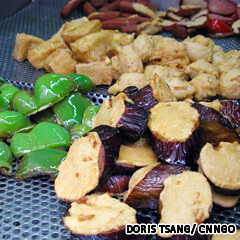 There are fried breads and steamed buns, there are pork and chicken skewers, there are hundreds of varieties of tofu. The point is that even if you are squigged out by the thought of eating something with tentacles (keeping in mind, of course, that lobsters have tentacles...), you can find a street food to try. I hear a lot of people, including Mr. Stoudemire, talk about actively avoiding street food while in China, and it truly makes me cringe. Not only does it make me cringe, I just don't get it. If you are soaking up the local color, like Mr. Stoudemire was, and you skip the street food, it's like you've taken in a rainbow but ignored the green. You're not getting the whole experience. Why would you purposely avoid part of the cultural palette? 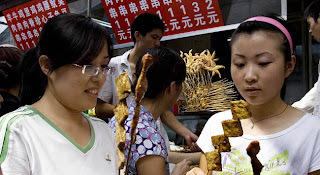 Like I said, I recognize that there are a number of reasons that people skip the street food while they are in China, but I really encourage anybody to give it a go anyway. It doesn't have to be scorpions...there are absolutely more familiar entry points. There's a whole world of flavors out there, and it's a real shame to miss them. 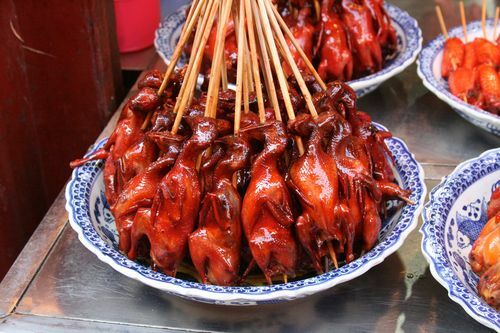 Direct message to Amar'e Stoudemire: next time you go to China, give the street food another chance. I don't think you'll be sorry. Warning: No pictures in this post...just a wall of text. A while back, I wrote a post about some preventative measures to avoid getting ill while eating street food as well as how to deal with it when it happens (which is inevitable). When I wrote that post, I was in fine fettle and good spirits. Shortly thereafter, however, my fettle turned very un-fine. I'm not sure exactly what it was or how it found me, but I spent several days in July under siege by a particularly aggressive stomach bug. It's been a long time since I was sick like that. Years and years. It was terrible. I was laid out. Incapacitated. I had forgotten just how bad it can feel. I am a big believer that we in the Western hemisphere--particularly here in the United States--should be eating more insects. This is not, at present, a point of view likely to earn me many friends. Nonetheless, I remain steadfast in this conviction. In much of the world, entomophagy is not a controversial lifestyle. Some estimate that 80% of the countries in the world include insects as part of their cuisines. Frankly, people who don't eat bugs are the minority in the world. Now, there are lots of good reasons to eat bugs. Entomophagy has something for everybody! You like protecting the environment? Raising bugs for human consumption requires significantly less food, water, and land than beef, pork, chicken, or really any other meat. You want to prevent animal cruelty? Unlike, say, chickens, most bugs actually kind of like being crowded together in tight living spaces. Want to eat healthily? Insects are full of protein and vitamins and (generally) low in fat. Hypochondriac? Insects are much less likely to transmit diseases to humans (remember the swine flu? The bird flu? Mad cow disease? When was the last time you hear of locust fever? Cricket flu? Ant pneumonia? That's right, you haven't.). So with all these reasons to eat insects, why don't we? I can only think of one reason, and, frankly, I don't think it's a very compelling one: people find it gross. Let's get past that, folks. For a more in-depth exploration about why we should eat bugs, watch this TED video. 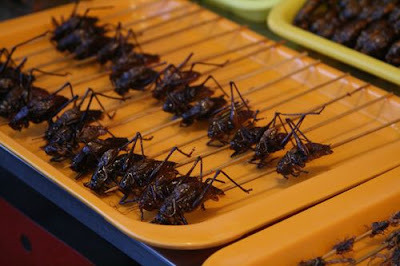 And keep an eye on this blog later this fall for my own adventures in Chinese entomophagy. Jon Huntsman Likes Street Food! I have just learned that lovers of street food have a high-profile name on their side: Republican Presidential Candidate Jon Huntsman! 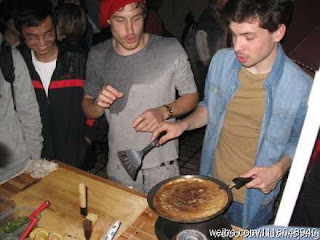 Huntsman, who until recently was the United States Ambassador to China (appointed by President Obama), described his love of street food (he calls it an "addiction" at one point!) in a video on his campaign site. Really! He devoted an entire two-minute video to his love of street food on this site that is designed to get him elected as the leader of the free world. Amazing! You can see the full video at this link (unfortunately, it doesn't seem to be embeddable). Huntsman attributes his love of street food to his time spent in developing countries. "Street food is so fresh, and it's so good, and it's so cheap," he notes. He talks most extensively about tacos, but with the amount of time he has spent in China he undoubtedly has some great stories about Chinese street food. If you happen to be the kind of person who uses "love of street food" as your guiding factor in deciding whom to vote for, it looks like you've found your man. "He's tough, he's precise, he was prepared for any battle any time where his stomach need to be." "From one place to another, nothing can stop him from conquering the last corner of the menu! He is Caesar of the street food, and champion of a swimmingly stomach! Foods, thou shall just sit there and waiting to be digested." "Because, he is about to start." " FRANK KASELL, COMING SOON!" Hello, friends. In the course of every blog's life span, there comes a time when the blog author must apologize for a paucity of posting. Now is that time for me. Admittedly, it feels odd to apologize for something like this. To me, an apology implies that I owe you something and that I have let you down by not posting more regularly. As if there was a noticeable absence in your life because I went a week without posting anything on my blog. 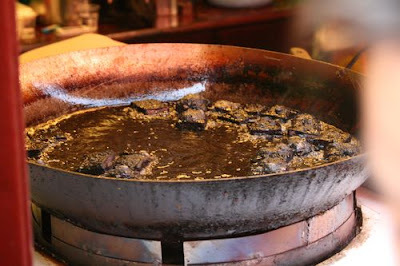 A Chinese-street-food-shaped hole that went unfilled for a whole week. Blogs and the bloggers who write them sometimes have a reputation for being self-centered or narcissistic. I can't help but feel that an apology for not sharing my boundless street food related wisdom with you, anonymous reader, is illustrative of why blogs have that reputation. Nonetheless, the fact remains that blogs ought to be updated regularly (some say it doesn't even count as a blog if it's not updated at least twice a day). On occasions where it has not been udpated regularly, it makes sense to acknowledge the breach of the unspoken agreement with established or potential readers. The best blogs foster dialogues about interesting topics, and dialogues can't happen if the conversation facilitator is a no-show. What I am saying is that I humbly apologize for not posting more regularly, and I thank you for bearing with me. That being said, I expect the dearth of regular posts will continue for the next few weeks. Between an upcoming move, two upcoming out-of-state weddings, and all of the myriad preparations for this China trip, times are busy here. Unfortunately, this blog has been shuffled off to fourth or fifth place on the list of priorities. Once I am in China I expect to update this much more regularly with reviews and travel updates and whatnot, but for now it's going to have to be more of a once in a while thing. Anyway, thanks again for bearing with me. 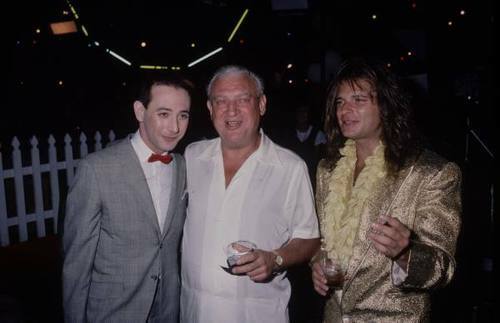 To keep yourself entertained during this time of infrequent updates, you might spend some time perusing the "Awesome People Hanging Out Together" blog. It is amazing. One of the questions I get most frequently when people hear about my project is, "Will your stomach be all right?" This is, of course, just a polite way (if there is such a thing) of saying, "aren't you going to be spending more time communing with the commode than...well, anything else?" My usual response to this question is: yes, my stomach should handle itself swimmingly. I've eaten my share of dodgy food items and have almost always come out victorious. That being said, it's nearly inevitable that if you eat enough street food you're bound to have some intestinal distress, even if you—like me—have a relatively iron-clad stomach. Simpsons lesson #381: Even the mightiest of stomachs has its limits. 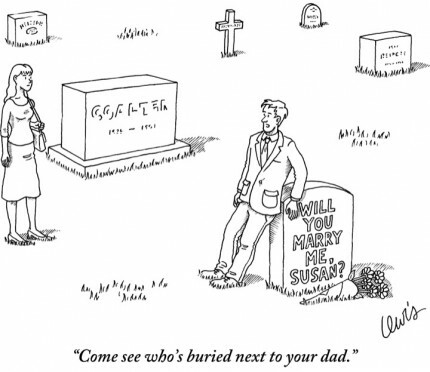 Fortunately, there are some ways to mitigate your risk a bit. The best tip I can offer is to follow the crowd. This may go against some treasured wisdom about not jumping off bridges just because everyone else is doing it, but this is a situation in which the crowd is probably jumping off of the bridge because there's a violent stomach virus waiting on the other side, so you're better off taking the plunge. That metaphor disintegrated about six words in, but you probably get the point: the locals know which vendors have a track record of making people ill. If you follow their lead, you are likely to avoid the worst culprits. Make sure the food you are eating is freshly prepared. If it looks like it has been sitting in the open air for a couple hours and is not currently the temperature it was designed for, it's probably best to wait for a fresh batch. Besides, it tastes better when it's fresh. Be careful about raw fruits and vegetables. I wouldn't say you should avoid them entirely (though some would), but at the very least give a quick look around to be sure they are being washed thoroughly with purified water. Some people recommend taking charcoal pills or Pepto Bismol tablets before you eat. It's easier for your stomach to be pre-armed against microscopic nasties than to try to react after they have already infiltrated your system. A bit of grime (aka "charm") isn't necessarily a problem, but use your common sense. 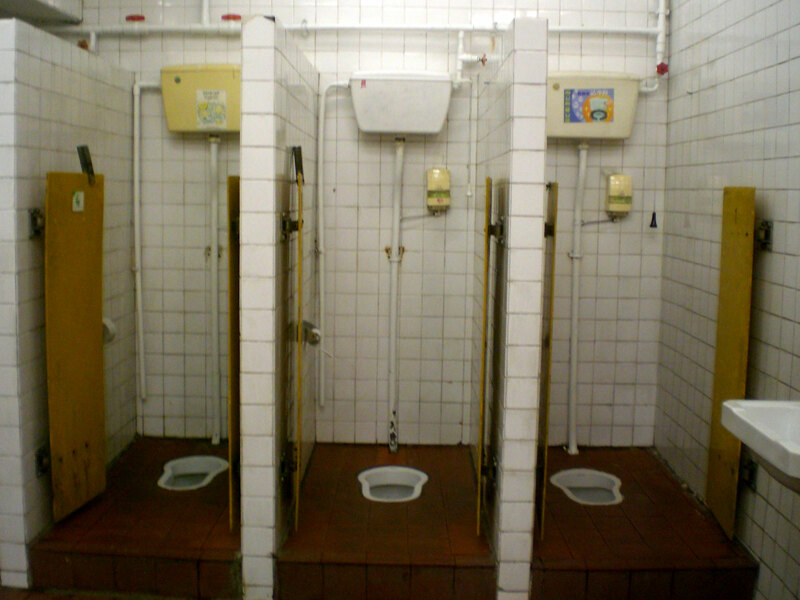 If there is visible dirt or mold (or rodents) hanging around the food or cooking utensils, you might be better off moving to the next stall. My main advice is not to be nervous and dive right in. Take some basic precautions, but accept the fact that you're bound to get sick if you eat enough of this stuff. It comes with the territory. If you do find yourself in the throes of dyspepsia, your best bet is to get some stomach pills and a bunch of bottled water and hunker down in a hotel room until you are feeling up to snuff. One thing to keep in mind in these situations is that this may be the time to spring for a hotel room with a Western-style toilet. Chances are that these are not going to be the days that you want to wrangle with a squat toilet. These cultural crossroads are the laboratories of civilization. Distinct elements of humanity come into contact, paths cross, mixing and recombining, adapting and innovating, creating something greater than the sum of the parts. As with productive ecosystems, these are often places of transit, frontiers, or islands amid a vast nothingness. Commerce, conquest, climate and imperialism usually drive the intermingling of different peoples, generating both friction and beautiful moments of coexistence and tolerance. More than abstract social experiments, these cultural crossroads also happen to make some of the most interesting, historically complex places to visit. I agree...these cultures are all the richer for their variegated heritages (is that a word? Heritages? ), and we citizens of the world are lucky to have them. What in the world is that stuff? It looks like a sea cucumber and a medieval mace had a litter of pups. Delicious. Whole crabs on the left, whole fish on the right. You are expected to eat the whole thing, shells and bones and all.